Interior colors for home staging should be selected from paint palettes that appeal to the most buyers possible. 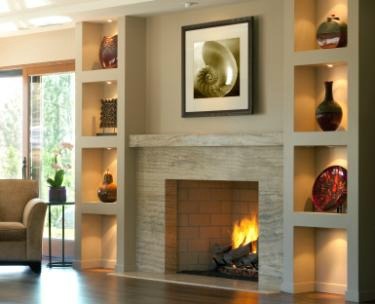 Try to limit interior colors for home staging to earth tones, neutrals, or warm shades of white. Neutral wall tones provide excellent backdrops for the accent colors you'll add later for home staging; in your furniture, draperies, artwork and accessories. Changing wall paint colors is the fastest (and cheapest!) way to update your entire home. The trick is to select colors that relate and flow from room to room. Paint colors that are too bold, dark, or bright will likely turn many buyers away, because they will be thinking about all the repainting they will have to do! 60% of a room is typically a dominant color - Usually wall colors. 30% of a room is a secondary color - Typically furniture, drapes and carpet. 10% should be accent colors - Accent colors are the “pops” of color that brighten and add excitement to a room; pillows, accessories, artwork, throws and flowers. The accent colors and patterns you select should be evenly distributed throughout a room. Avoid placing all your accent colors (and patterns) on one side of a room. Complementary colors are two colors placed opposite each other on the color wheel. The predominate shade should be 80%, the second color, 20%. If used in equal proportions, complementary colors will compete with each other, creating a jarring effect that may make some people feel anxious. 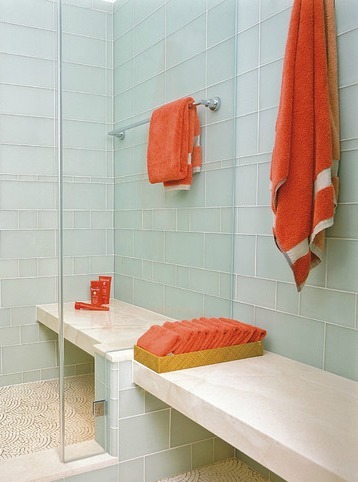 The complementary color scheme in this bathroom works well for home staging, because the background is very light and neutral, whereas the orange accessories are removable if buyers don't like them. If you reversed the colors; having bright orange tile instead of a pleasing neutral, it might be a deal breaker for many buyers. 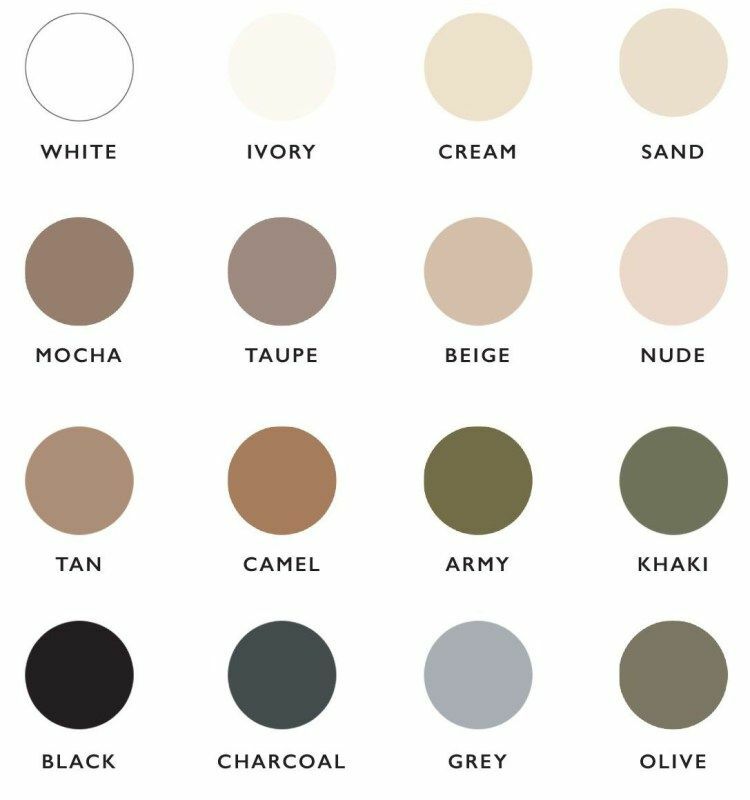 Neutrals include black, white, all the grays in between, beige, taupe and earth tones. Neutral colors are the easiest to decorate with because they blend well with most surroundings, go with everyone's furniture, and work successfully in all room designs. Neutral color schemes don't have to be boring! 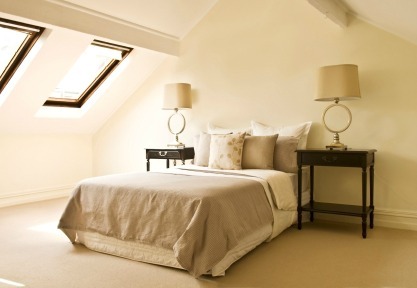 Neutrals can be very stylish and sophisticated, as in the beautiful bedroom on the right. Examples of interior colors for home staging that most people love; beige, taupe, ivory, coffee tones, honey, butter, golden, wheat, blue-green, mossy green, brown, blue-gray, and gray. Gray is a sophisticated color and very trendy at this time. Gray complements all other colors and serves as an excellent backdrop for bright colors, allowing them to stand out. Light neutrals and earth tones have the widest appeal among home buyers, complement most people’s furniture and are liked by both sexes. Classic room designs start with one main color and one or two accent colors. Start by finding one main color you like; perhaps drawing color cues from a favorite fabric, area rug or a piece of artwork. The easiest way to prepare your home for sale is to paint all of your walls in the same neutral hue. Each room will look slightly different, because color changes under varying lighting conditions. Create color flow from room to room by using lighter and darker values of the same color. 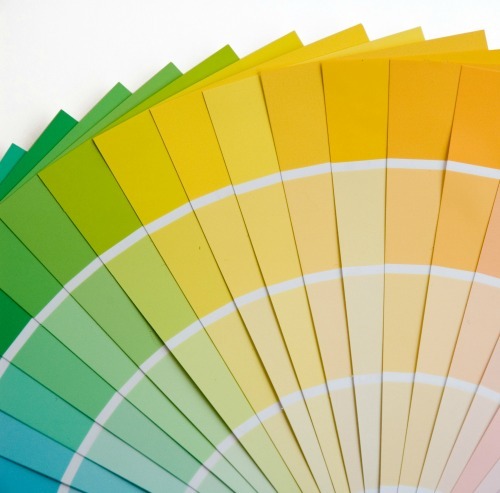 A fan deck or paint color swatch from any home improvement store can help you select interior colors for home staging. Paint sample strips help take the guess work out of choosing paint colors, as they contain the same color in several different values. Value: Varying degrees of light and dark-- the "brightness" of a color. Select a monochromatic color scheme. Doing so will help with the flow from room to room. Try to stick to a color palette of no more than 3 to 5 different colors in your entire home. I love Benjamin Moore paint because it's highly saturated, giving it great coverage. Often you can get by with just one coat of paint. Note that paint color palettes change every few years, so if you're looking for that great color you used 3 years ago, you won't find it! But don't panic, most paint stores now have the technology to match any color, you just need to bring in a color sample. Color changes according to the type of lighting you have in a room. A color that you're happy with in natural light will look completely different under incandescent lighting. What kind of natural light does each room have? Are you going to be using the room mostly at night under artificial lighting or during the day? Is the room facing north or south? Consider the room that you'll be adding color to and view your paint samples under all lighting conditions, and at different times of the day. Many paint companies offer sample-size containers of paint that you can take home and try out before committing to larger cans. Incandescent light will typically add a warm yellow cast to colors. Fluorescents create a cooling gray cast. Halogen bulbs produce a very white light and have little effect on color tones. Colors that look vibrant in natural light will often wash out under incandescent lighting. Be wary of using dark colors in rooms facing north--they'll appear darker. Warm paint colors will cheer up a room with a northern exposure. Paint colors will seem lighter and brighter under a southern exposure. Tone them down by painting in cool neutral colors. Think of each room in your house as a vertical space, mimicking nature; Floors could be a darker value, wall colors a medium value and the ceiling in the lightest values. If you follow this basic rule, you should succeed. Interior colors for home staging should flow gracefully from one room to the next, especially if you can see the adjoining rooms, as in open-concept living areas. You can achieve this by painting all your walls in the same paint colors, in coordinating colors, or in lighter and darker shades of the same hue. Neutrals and earth tones create good flow between the two rooms. To expand visually a space (or to hide ugly moldings and window trim), use the same light color on walls, baseboards and trim work. Doing so will cause unattractive features to recede, or seemingly blend into the walls. Another way to develop flow is to have one recurring color from room to room. For instance, the color of a wall in the living room can be carried over into the dining room in the form of an area rug, upholstered dining chairs, a tablecloth, artwork, and so on. How many times have you painted a wall and the color wasn’t what you expected? You thought you chose ivory, but it looked pale pink once up on the walls! How does that happen? Undertones aren't always apparent until paired with other colors, or under certain lighting conditions. It's like a secret color hiding within the paint! When you first look at a color you see what is called a "Masstone". This is the color we all recognize right away. Hidden within the masstone is an undertone, not easily seen. A color is created by mixing two or more colors together. The color that is used in greater proportion will determine the undertone of the color. For instance, if more green was used than any other color in the mixing, then green will be the undertone. Hold a paint color sample against your furniture, kitchen countertops, cabinets, flooring and under different lighting conditions. You will be amazed at the undertones that pop out. Years ago, I rushed home with four cans of what I thought was a luscious taupe exterior house paint. After I had almost completed one side of my house, a neighbor drove by and asked why I was painting my house purple. Puzzled, I stepped back to look and was shocked to see lilac undertones! Eventually, after two more trips to the paint store, I got it right. Color is the key to all successful decorating— it can work magic by visually expanding or shrinking space, raising and lowering ceilings, even effecting our dispositions. You can trick the eye by using certain colors in the right places. Color can make objects visually advance or recede, and knowing where and how to use them can help you highlight focal points or camouflage ugly features of your home. Proper color combinations can deceive the eye into thinking that a small room is larger than it really is, or take an awkward space and make it less noticeable. Pale colors reflect light, and when combined with lots of natural light can visually expand a small room by giving the impression of pushing back the walls. Dark colors absorb and deflect light and give the impression of the walls closing in on you. Cool colors appear to retreat, while warm colors seem to advance. Interior colors for home staging should have a combination of cool and warm colors in the design palette, but one or the other should dominate. Minimize the length of a long narrow room by painting the long walls a light color and end walls in a darker warm shade of the same color. Because darker colors advance, this gives the effect of "squaring" the room. Painting a high ceiling in a darker paint color, and bringing that color down a foot or so onto the wall will make the ceiling appear closer. Paint colors that work well in small spaces are whites, neutrals, pale grays, blues, lavenders and greens. Visually lift a low ceiling by painting it white, or a light pastel hue. 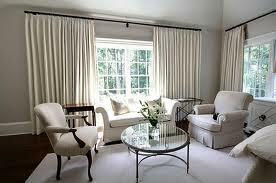 To make a small room feel larger, paint the walls the same color as the drapes. If your room has ugly window trim, or is broken up by numerous doorways, windows, and nooks, paint them the same color as the walls to unite all the broken areas. For over-sized rooms, use a combination of warm and darker colors. The dark colors will make the room seem cozier and more intimate. What's the difference between monotone and monochromatic color schemes? Both schemes use only one color and rely heavily on the use of textural elements, accessories and plants to prevent boredom. Both room designs create a sophisticated and restful space that will make a small room appear larger than it actually is. The monochromatic color scheme employs different tones, shades and tints of one color. The monotone color scheme uses one color with very little variation in value, saturation and brightness. Done correctly, the monotone color scheme can be very calm and soothing. Browse through interior decorating magazines or look online for ideas. Study room designs that appeal to you and try to determine what it is that makes them successful. 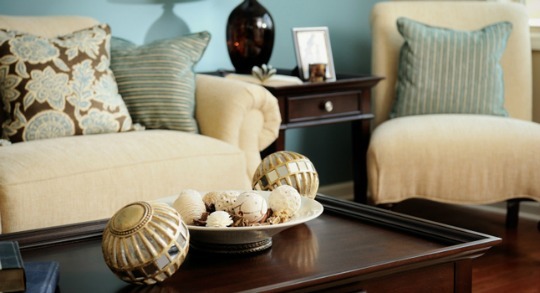 Use a favorite picture as a starting point for selecting interior colors for home staging. Paint your basement and hallways in light colors, since they are usually too dark. Try a coordinating color on an accent wall to add excitement to a room or to draw attention to a lovely window, fireplace, or other architectural detail. If you have a lot of bumps and dings in your ceilings and walls, use a flat paint. Because it doesn’t reflect light, imperfections on walls and ceilings are less noticeable. Unfortunately, flat paint is not very scrubbable.